On any night I use this recipe to make a quick dinner for my family. 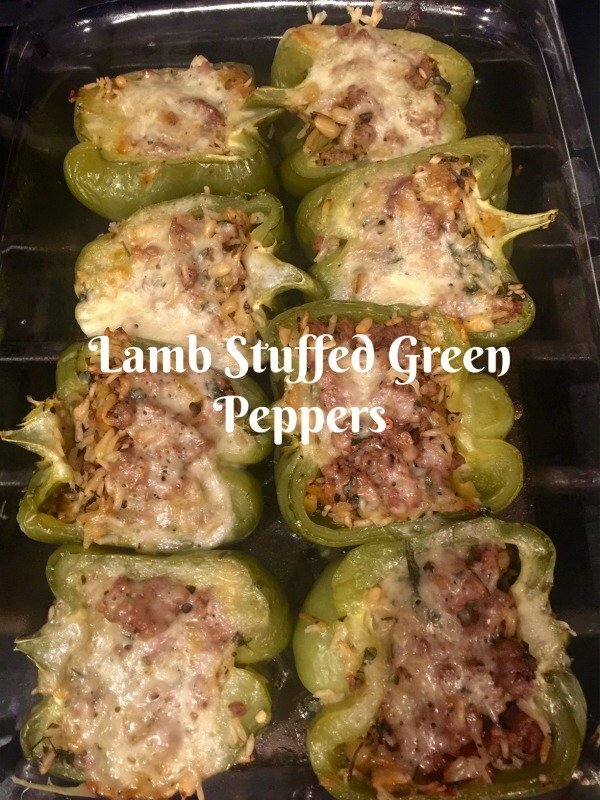 I tend to keep green peppers on hand and lamb in my freezer. It’s one of those dishes you can pull together in no time. I shop for ground lamb or you can use ground beef, at the butcher department of the grocery store. He can always grind you a pound or two. The choice is up to you what rice you use, I use organic rice from Lundberg Farms. Whatever you have on hand works, this is what I call a pantry recipe. Choose your meat, lamb or beef or use mushrooms, grains, and rice only for a meatless version. Select whatever hard cheese you may have on hand. I used a salty hard Greek cheese. Choose your onion. You can use red or white onion, leeks, green onions, shallots and garlic. These are four peppers I cut in half, they cook faster for a weeknight dinner. Start with a large pan and saute the meat, onions, and salt and pepper. Stuff and add your cheese. The cheese is optional, but do drizzle with extra virgin olive oil before baking. This is a perfect Greek main dish to serve to your family on any given night. Prepping can be made ahead of time and baked when you get home. Serve with a dollop of yogurt or sour cream. This recipe has been in our family for years, tried and true. 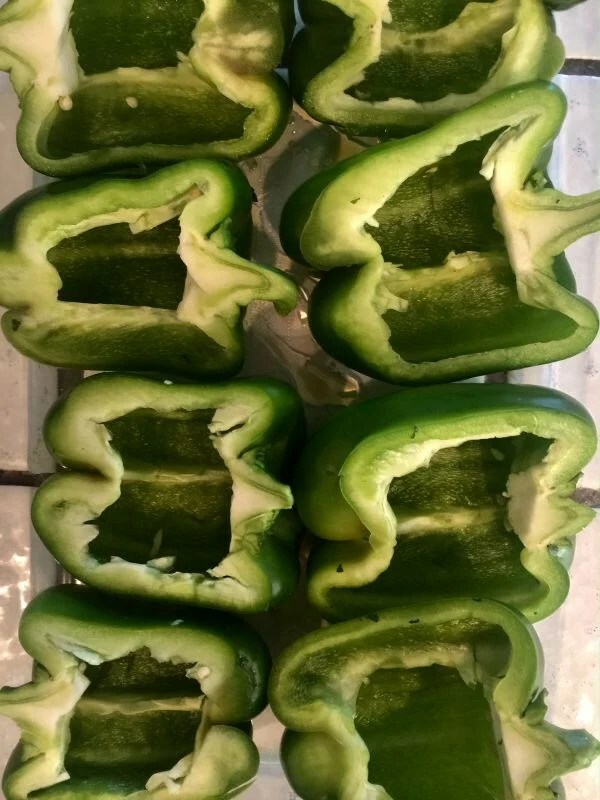 Wash and cut your peppers in half. 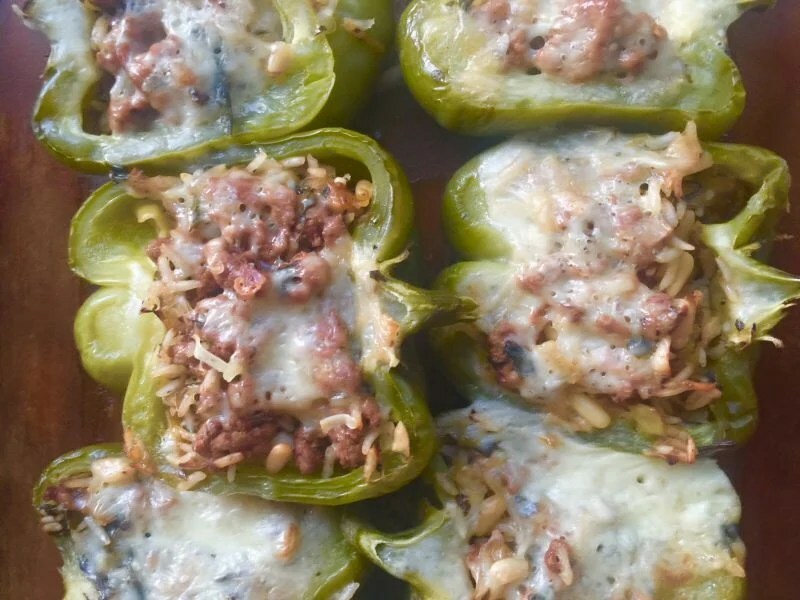 Clean out the inside of each pepper , dry and place cut side up in an oiled casserole dish. In a large saute pan with deep sides or a dutch oven, add 2 teaspoons of oil and begin to saute the lamb. Add a pinch of salt and pepper. Add the leek, garlic, tomato paste, and oregano and saute until the meat is brown and the juices have evaporated. Add the rice, pine nuts and parsley and continue to cook for 15 minutes on low to par-cook the rice. Taste for seasoning, if needed. This step is very important to taste as you go. You may need to add a tablespoon or two of water. Stuff the peppers to the top. Add the cheese. Drizzle the peppers with olive oil. 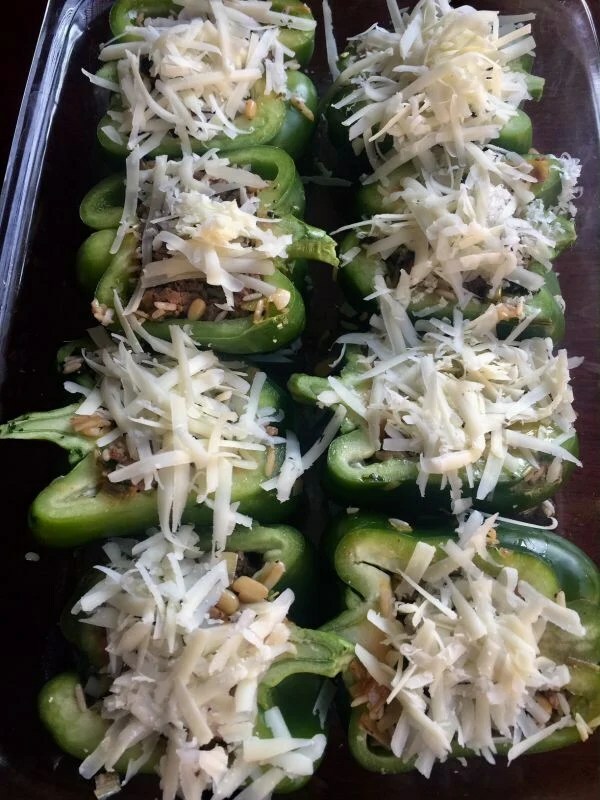 Add a little of water to the bottom of the dish and bake in the oven for 30-45 minutes at 375 degrees until peppers are soft. Remove from the oven and serve warm with Greek yogurt or sour cream. You can make this ahead and freeze it before baking. Or you can prep it ahead of time, refrigerate and bake that evening. 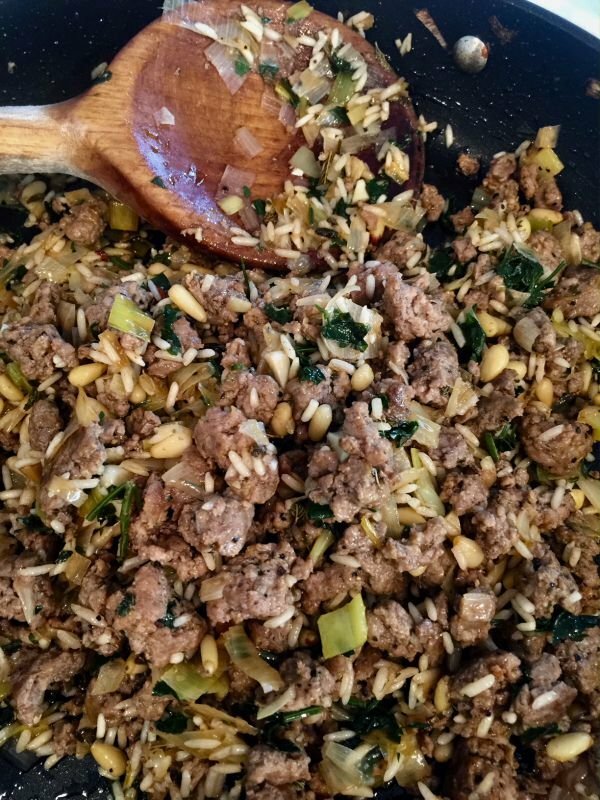 Make the meat mixture the day before and refrigerate and bring to room temperature before stuffing.